Soft pretzels were one of the first things I ever baked. Going through my mom's old recipe box was a favorite childhood pastime, and therein I found a handwritten card for pretzels and asked her if I could try them. After she warned me about the many steps and somewhat dangerous water bath, and I was still game, she conceded, and the twisted, boiled, and baked malted breads became a personal favorite. A few years later in middle school, I made them for a special final project in my Home Ec class, and that year most of the comments in my yearbook referred to those pretzels. 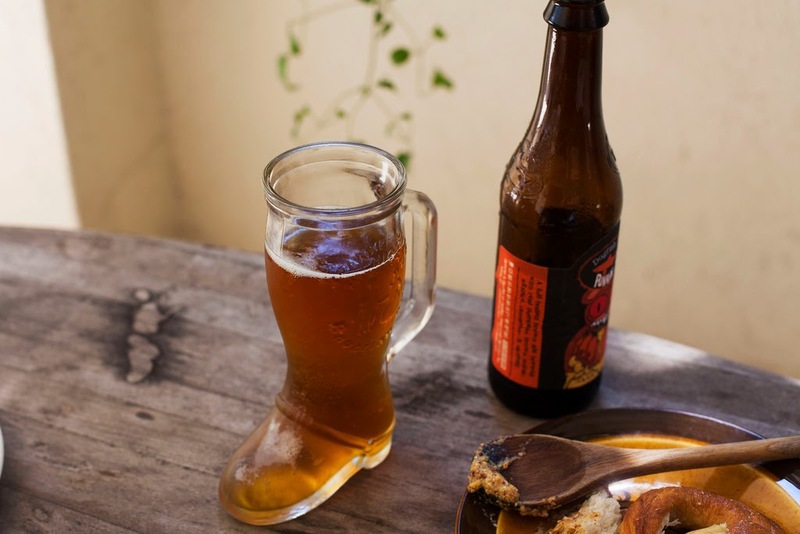 So when my pals at MUTINY DC suggested making some for an Oktoberfest post, I was ready, and was promptly sent into a nostalgic Midwestern reverie--but now with beer! It's no surprise, though, that ale & pretzels are a perfect pairing, as both have monastic origins. Pretzels are said to have been invented in the 7th century by an Italian monk-- the twists are thought to resemble hands praying. 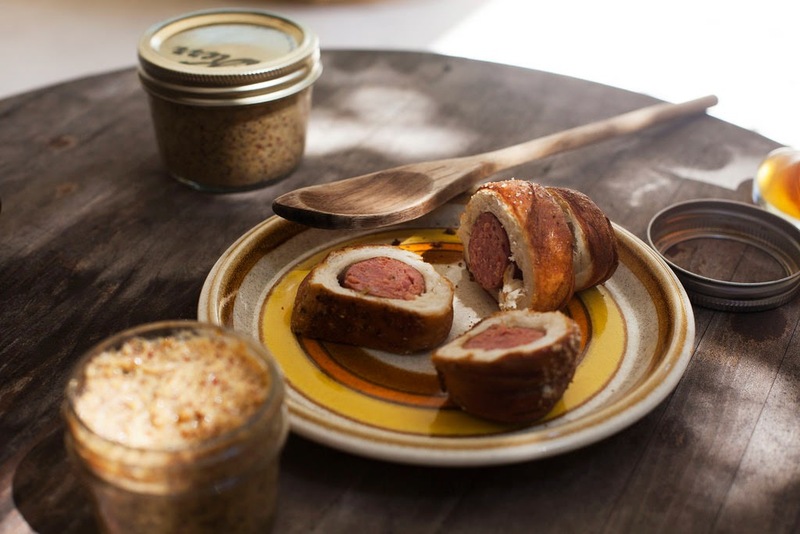 But throw a Meats & Foods sausage and some whole-grain beer mustard into the mix, and you've got yourself a meal--one that feels more decadent than ascetic. 1. To make the pretzel dough, in the bowl of a stand mixer, combine warm water and yeast. Let stand for 5 minutes, then whisk by hand to dissolve the yeast. Add 2 1/2 cups of the flour, sugar, and sea salt. Stir with a wooden spoon to form a stiff and shaggy dough. 2. Using the dough hook of a stand mixer, knead the dough on low for 5 minutes. If the dough is very sticky after 1 minute, add 1 Tablespoon of flour at a time until it forms a ball and is soft, slightly tacky, and holds its shape in a ball. 3. Clean out the bowl, coat it with oil, and return the dough to the bowl. Cover with a dishcloth and let rise in a warm place until the dough is doubles in bulk, about 1 hour. (After this step you can refrigerate the dough for up to 3 days before boiling and baking the pretzels. Make sure the dough is wrapped tightly in plastic wrap before refrigerating). 4. Once dough has risen, turn it out on a lightly floured surface, and divide into 8 equal pieces. To shape the pretzels, roll each piece of dough into a long, skinny rope, about 20 in. long. Bring the ends of the rope toward the top of your work surface and cross them. Cross once again to form a twist, and then fold the twist over the bottom loop to make a pretzel shape. 5. 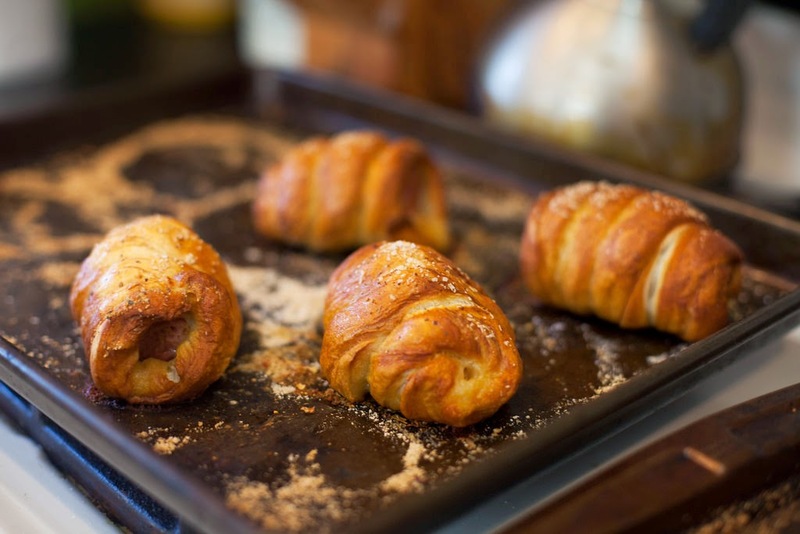 Place each pretzel on a parchment-lined baking sheet and set aside while you form the rest. When all pretzels are shaped, cover them loosely with a dishcloth and let rise until puffy, about 30 minutes. 6. Preheat oven to 450 degrees F and place oven rack in the middle-bottom. While pretzels are rising, prepare the water bath. Pour 8 cups of water into a tall, wide pot and place on high heat (make sure pot is tall as water will bubble when you add the baking soda). Once water is at a rapid simmer, add the baking soda and barley malt, rice syrup or brown sugar. Stir to dissolve, then reduce heat to medium to maintain a simmer. 7. Once pretzels have risen, lower 2-3 pretzels into water bath at a time. Simmer for 30 seconds on one side, then flip using a slotted spoon or metal spatula. Simmer for 30 seconds more, then remove from water and return to baking sheet. Repeat with remaining pretzels. They should be puffed, doughy, and slightly puckered. 8. When pretzels have simmered in the water bath, brush them with egg was and sprinkle them with coarse kosher salt. Bake in the oven until they are deep brown and glossy, 12-15 minutes. 9. Transfer to a wire rack and let cool until they're cool enough to eat. 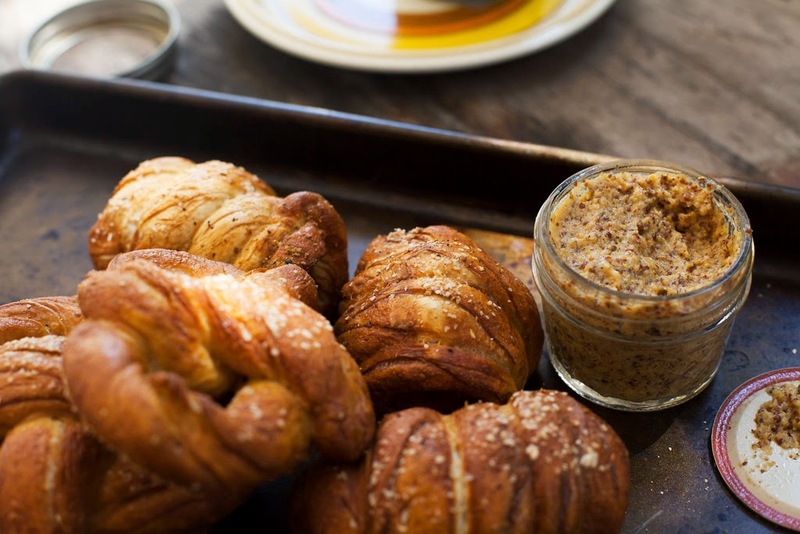 Serve fresh 'n' hot with homemade whole-grain beer mustard (see below) and Dogfish Head Punkin Ale! 1. Cook sausages in a skillet, let grease drain, and cut in half. Let cool. 2. Prepare pretzel dough as indicated above, but instead of shaping dough ropes into pretzel shape, coil them around each sausage, starting at one end and finishing at the other. Seal edges so entire sausage is covered and dough will stay wrapped during the water bath. 3. Follow steps above for simmering. When it comes time for the egg wash and salt sprinkle, you may also want to sprinkle on some fresh cracked black pepper. Follow instructions for baking--the bake time is about the same for regular pretzels. 4. 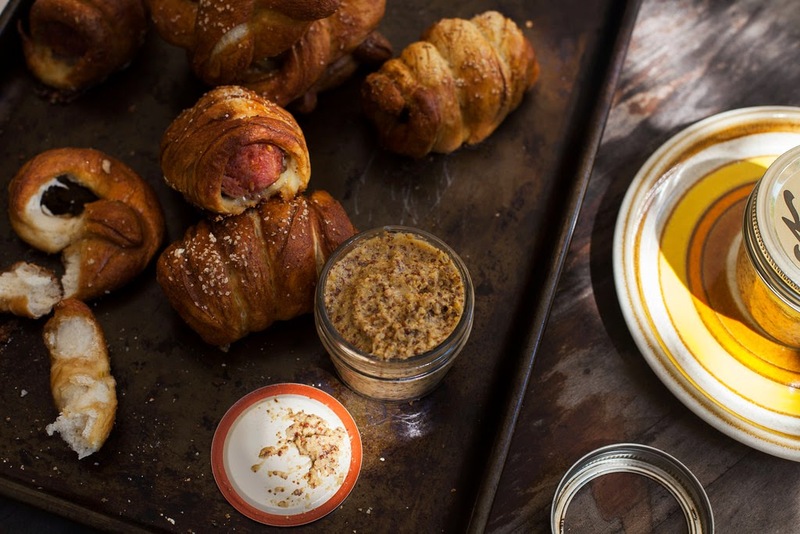 Remove from oven and let pretzel dogs cool on a wire rack. Serve with homemade whole-grain beer mustard and Dogfish Head Punkin Ale. 1. Pour mustard seeds into a medium-sized mixing bowl and whisk together until combined. Add vinegar and beer and stir just until incorporated. 2. Cover mixture with plastic wrap and set in a cool, dry place for 12 hours (overnight) or until most of the liquid has been absorbed (a little remained in my batch, but extra food processing time took care of that). 3. Stir remaining ingredients into the mustard seed mixture and pour into the bowl of a food processor. Pulse processor 5-6 times before running the motor for 1-2 minutes. 4. Once mustard has thickened to your desired consistency, pour into a sterilized glass jar(s) and refrigerate. For an even spicier mustard, leave out at room temperature for 1-2 days before refrigerating. Find MUTINY DC's original post here and our previous collab here. Pretzel-wrapped sausages? OKAY! This sounds so hearty and delicious! And you have to love the idea of making a big tray of delicious snacks to go with beer. Yay! SO SO MUCH MUCH DELICIOUS. These look delicious but is 2 tablespoons of yeast correct? Seems like a lot and the original recipe says 2 teaspoons. CK-- good catch! It should be 2 teaspoons. Fixing now. Thanks!